I normally don't participate in memes. However, I am me-too'ing Jessamyn's tech-NOs post because I like the idea behind it. A lot of librarians (and regular people) I know are hesitant to try new tech/web things because there is just so much out there and they feel they have to know about everything before they can try anything. That is absolutely not true. Even though some people think of me as high-techy because I have a website and use flickr and bloglines, there is a lot I don't know about (and a lot I don't care about). My advice is to use tech tools to augment your life/work style, not change it; pick what you like and play with it, and ignore everything else. I do not have a microwave. I'm sure there's more, but that's good for now. *In typing up this list, I realized that all of the *'d things were given to me by my younger brother. Thanks, Mike. And I still don't want a cell phone. Posted under Personal, Technology on Tuesday, March 4th, 2008 at 11:46 am, by Brian Herzog. Post and comments available via the RSS 2.0 feed. Both comments and pings are currently closed. Nice. You must have a beautiful power bill. p.s. I think Twitter is silly too. You don’t have a *microwave*??? How do you make popcorn? How do you heat water – on the _stove_? *utter disbelief* A twirly lawn mower? I think the last time I saw one of those was in Little Shop of Horrors… But all that I can understand, I suppose, except – no air conditioning? Maybe it’s because I live in the South, but brother you have got to be kidding. From here on out, whenever I think of this, I’m always going to have this mental picture of you in full pioneer regalia, fuzzy hat and all, churning your own butter. Yes, my power bill is pretty low; but I also live in a very small house in a temperate climate. If I were in Texas or South Carolina, I might have to rethink the air conditioner (but then, I also probably wouldn’t need to put plastic on the windows in wintertime). As for popcorn, I have a hot-air popcorn popper. I generally don’t like single-use appliances, but popcorn is special. Especially when soaked in hand-churned butter. I have a microwave but I still make popcorn either on the stove or with one of those plastic pumper things. My biggest electrical expense/luxury up here is the electric mattress pad warmer that I use to keep the bed from being freezing at night. 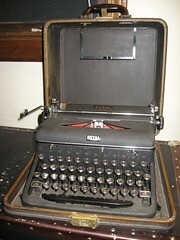 I have a royal quiet de luxe typewriter that needs ribbon. Where do I get that? I live in Salt Lake CIty, UT, do you know of any places there or do you konw of any places on line that I can get them quickly mailed to me? @Catlin: someone commented on my flickr picture that http://www.scantracker.com/royal_typewriter_ribbons.htm is a source for ribbons. I haven’t tried them yet, as happily my is still working (although my printer’s ink cartridge dried out). I hope you find one.